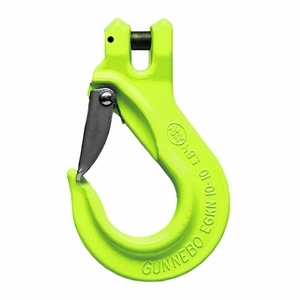 Whether you call them sling hooks or slip hooks, these Grade 100 hooks are one of the most popular types used on rigging chains. In addition, these particular hooks have a profile that is familiar and a favorite among many users. Their relatively narrow shape allows them to attach quickly and securely to eye bolts, d-rings, etc. They feature a heavy-duty, spring-loaded safety latch (replacement latches available) to ensure securement when in use. They are individually proof-tested and certified with a 4:1 safety factor.